For Sarah Grandstaff, Eastern Illinois University Study Abroad! The first week of this trip went by and felt more like molasses than seven days. We are now nearing the end of week #3 and I can’t believe how fast it’s flying. I think the reason for this is that now we are much more accustomed to the culture and the lifestyle. We are slowly getting used to the ins and outs of this city. However, I’m still blown away by the new things that I see each day. I still feel as though this trip is one long dream and that at any moment I will wake up in my bed in Illinois. Not only is this the longest I’ve been away from home but it is also the longest that I’ve been in a city. As someone who has lived in a small town my entire life, being thrown into one of the busiest meccas of this planet is quite a shock. I am very much looking forward to my return home and I am very happy to have had the opportunity of a lifetime. Before you hop on the plane to study in another country, find a little translation book for often used phrases. You wouldn’t believe how far knowing just a little of the native tongue has gotten me. Luckily, I studied a little French a few years ago before I even knew I would be traveling to France. Just knowing those quick little everyday phrases has helped me to blend in and seem more like a local. So if you can, maybe pick a country with a language that you’ve studied. If that’s not a possibility, you should be just fine if you memorize a few phrases from a translation book. Just putting forth a little effort in speaking the local language shows that you are being courteous and once you’ve shown that you are trying, they will return the favor and make it easier for you. The truth about studying in another country is that it can get expensive. However, if done right, it is certainly affordable. Instead of eating out every night or spending a lot of money on souvenirs and clothes, keep your purchases to a minimum. If you really want to buy something, think about whether or not that certain item is authentically from the country or if it may be something that you could easily buy in the U.S.. Eating foreign food is definitely an experience and you should certainly step out of your comfort zone and eat out every few nights. However, don’t think that going out and buying groceries is going to feel less like an adventure. A lot of the fun that I’ve had so far has been in trying all of the food products here in France (candy, breads, drinks, etc.) So try to make your cash last if you can. Bring enough to get by and then when you have a little extra, you can buy that really cool authentic item from the country you’re studying in. Thanks to my wonderful mother, aunt, and grandparents, I can enjoy myself in France without having to worry too much about how much I’m spending. Before coming to Paris, I had always thought of it as an imaginary dreamworld. It has always seemed like a fictional place that we learned about but never really thought of as an actual living city. On my way here, I expected to arrive and be in this honeymoon state in which everything would seem incredible and that I would eventually get used to the city and it would seem very comonplace. However, after being here for a week, I am still extremely overwhelmed anytime I step outside. I can’t imagine ever getting used to the beauty that this city holds. Everyday we see something new and magnificent and I have come to realize that living in a dreamworld is entirely possible. Finally getting settled into our dorm here in Paris! After at least 30 hours without sleep, I am having trouble typing all of this without drooling onto the keyboard. Which brings me to my first word of advice for fellow travelers, IF YOU CAN SLEEP ON A PLANE, SLEEP ON THE PLANE!! We arrived in Paris this morning but in order to avoid being jetlagged for a few days, we had to wait another 12 hours to sleep. I am a mere half an hour away from sweet and glorious sleep. So if you have the ability to catch a few Zs on an uncomfortable plane ride, do so because it will pay off in the long run. Also, if you are assigned class readings to do before you depart, don’t wait until the plane ride to read them. I thought “Sure, I’ll have plenty of hours on my long plane ride to read all of that stuff for class.” The truth is that today, plane rides aren’t all that dull. The plane we were on had fully loaded tv monitors in the back of each headrest. Instead of reading my materials, I watched a couple movies and even played some games. So if your teacher tells you to read the materials before you depart for the trip, do exactly that because you’ll be kicking yourself if you don’t. 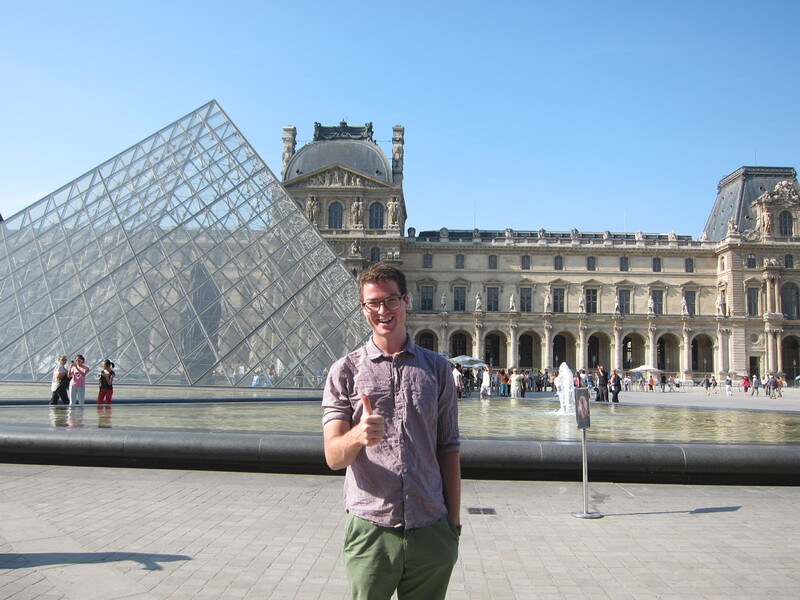 As far as culture shock, I experienced it immediately upon entering the city of Paris. Expect to be blown away no matter where it is you’re traveling. Having never left the country until now, I had never knew just how different life is in other countries. We’re on the other side of the planet but it feels to me like another world. I’d tell you more but I’m nodding in and out of consciousness. Expect more in the near future!